On my trip through the Adirondacks we were constantly on the go and changing hotels every morning, which is understandable as the Adirondack Park itself is 6.1 million acres and we had so much more to explore than just that. However if I were to visit again I would prefer to stay in one place and do day trips from there or at least only move every two or three nights. 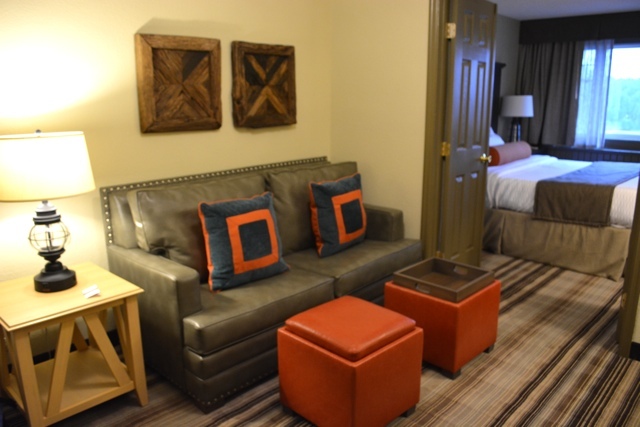 My favourite hotel of the six that we stayed in was Hotel North Woods in Lake Placid. 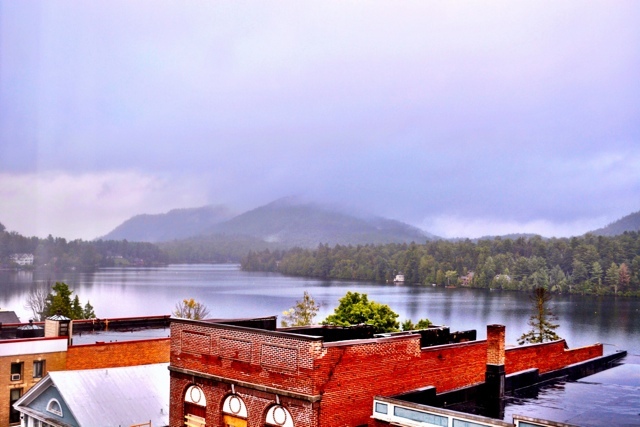 Located in the northern area of the Adirondacks between Lake Champlain and Schroon Lake, the village of Lake Placid is home to roughly 2,500 people. Being one of the more well known villages in the park and home to two winter Olympics, it is quite a popular place to visit and there are tons of things to see and do in the city. Upon entering my room at Hotel North Woods I was greeted with a few UBU Ale’s already on ice from the nearby Lake Placid Pub and Brewery. Bonus! They might have spelled my named wrong (which I’m use to) but they more than made up with it with the Moose Crunch treat left for me as well. Popcorn. The key to my heart. The rooms in the hotel are quite large with a nice seating / reading area breaking up the room and leading to the separate bedroom. It really felt quite homey and I enjoyed having space to move around in. Newly renovated in the past few years the design in the room was very clean and modern, while still playfully having a kitschy woodsy feel about it that suits the location in the Adirondacks. 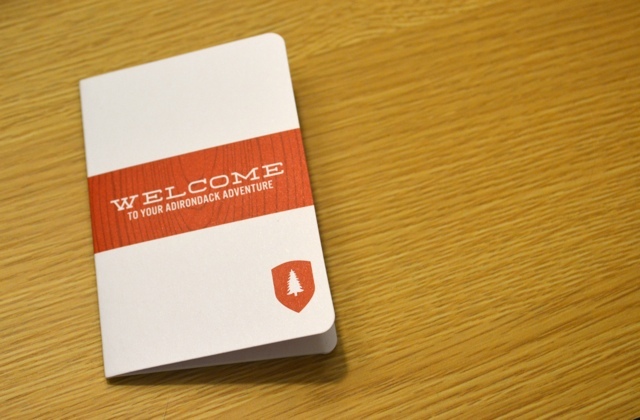 Even the key holder given to me on check-in was welcoming and tied into the theme of the rooms. Little touches like this really make a place. 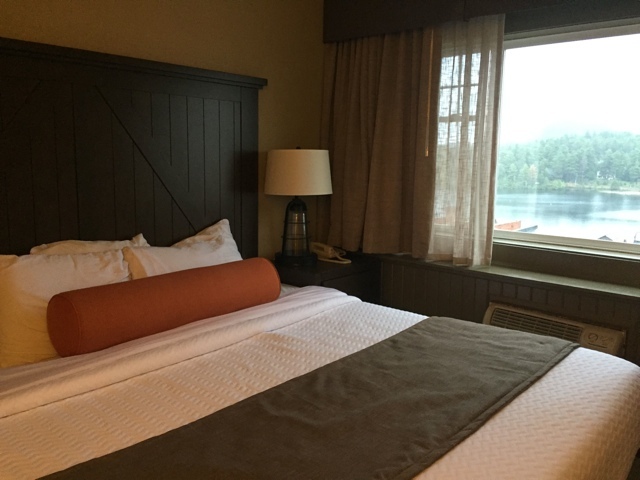 I was given a Lake View King Suite and my bed was extremely comfortable with some of the best pillows. However my favourite thing about the bedroom might have been that small wooden alarm clock that you see on the nightstand. Not only was it made of wood, but it was also a USB charger for my phone and could play music from my iPhone via bluetooth! So high-tech for a block of wood! The bathroom had the sink separate from the toilet and shower which I really appreciate when I am staying with someone else, so that more than one person can get ready at a time. 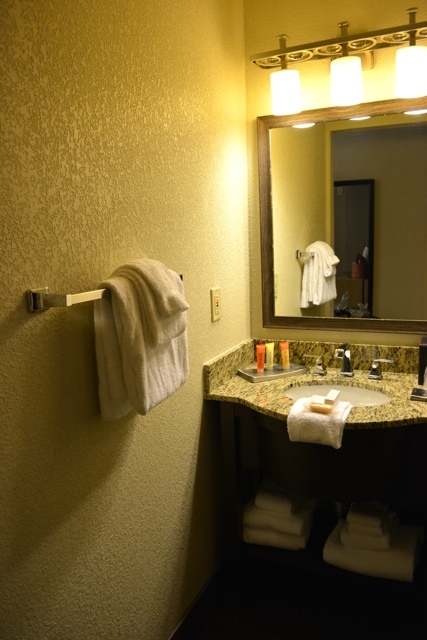 All rooms are also provided with hair dryers but just a warning they are hidden underneath the sink behind the towels. I figured that one out the hard way. I swear it was hiding on me! 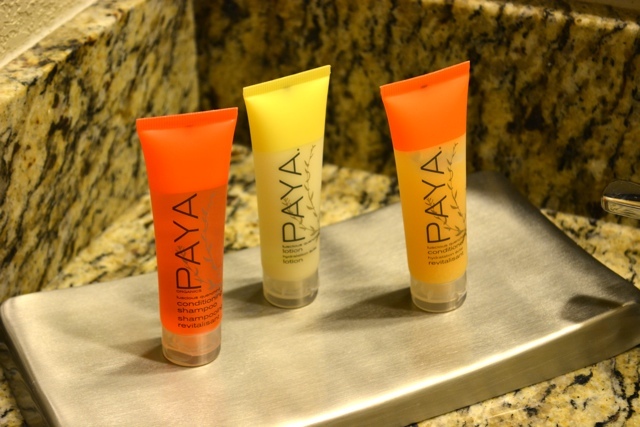 The bath products also smelled wonderful and were by Paya Organics. One of the best parts of my room (aside from the alarm clock) was of course the view of Mirror Lake. If you know me and you have seen my other room reviews you know that I feel like a great view really can make a room and this one definitely had that even though the lake is across the street from the property. Isn’t that a lovely view to wake up to every morning? Again if and when I return to the Adirondacks I would love to stay here for a few more nights. 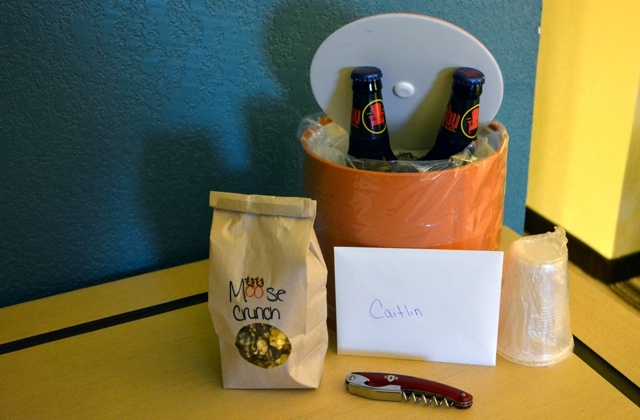 Extra amenities in the room: a microwave, mini fridge, coffee maker and wifi. Also there was a unique feature of a mini library with a small selection of books with a “take one, leave one” policy so you can trade your books with past and future travellers. 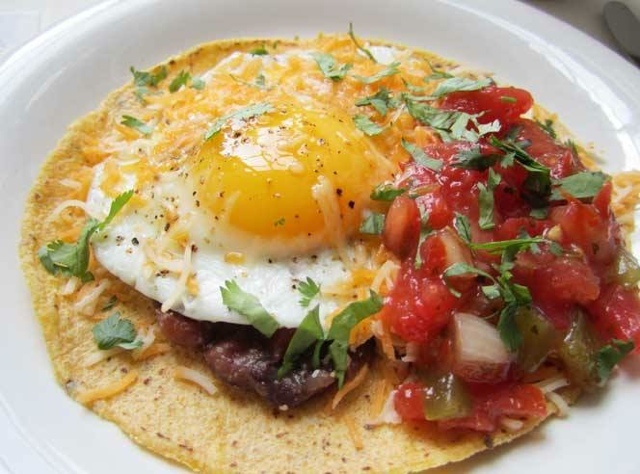 The huevos rancheros at the Cabin Grill – Looks tasty! On property there is also the Cabin Grill serving up delicious breakfasts each morning. From memory I think I enjoyed the Lox & Bagel. Whatever it was, it was so good that I ate it before taking a picture. This is very odd for me to do, thats how I know for sure that it was delicious. In May 2012 the other restaurant on the property was rebranded to the Delta Blue and it is now a popular bar and restaurant with live blues music, open mic nights and shows often taking place to entertain the patrons. 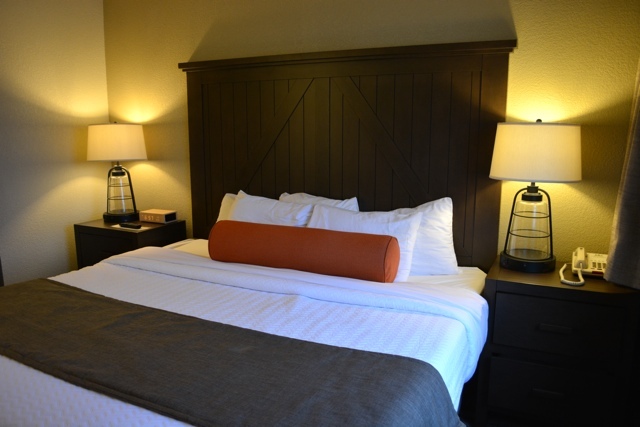 If you ever happen to find yourself in the Lake Placid area I highly recommend you stop in for a visit to Hotel North Woods and stay for the night or two or five. You won’t regret it.